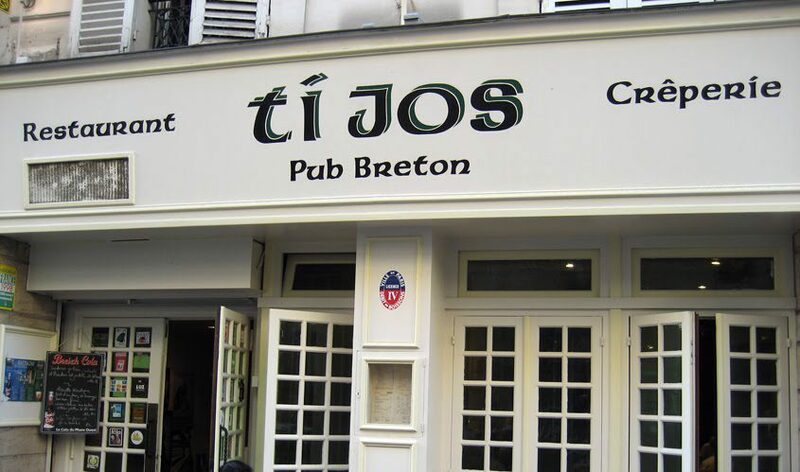 Ti Jos is a traditional Breton creperie in Paris I recommend in the Montparnasse district. Looking for a good traditional Breton restaurant and creperie in Paris without even a hint of pretention or stuffy formality? 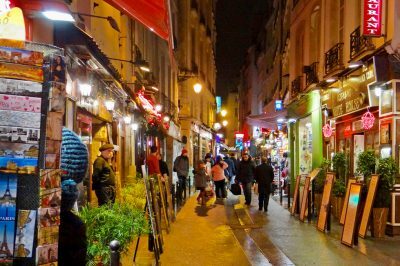 Ti Jos may be the ticket, especially if you’re staying in or around the southern Montparnasse district. This warm, casual pub serving simple and tasty dishes from France’s Brittany region offers unusually hearty versions of savory buckwheat galettes. Their delicious dessert crepes are equally generous. Recipes are simple and eschew all pretentions of catering to “fusion” tastes or complicated ingredients. You can also partake in decent ciders or Breton beers and, on certain evenings, enjoy live music from Brittany and Ireland. This is, moreover, an ideal place to take kids, especially fussy eaters. 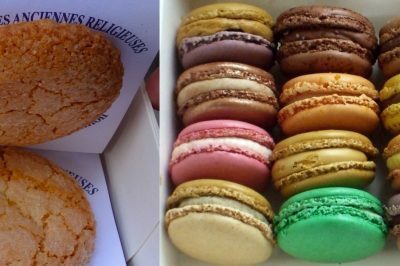 For all of these reasons, Ti Jos made the cut for my list of some of the very best crepes in Paris. A goat’s cheese and tomato savory “galette” at Ti Jos: simple but delicious. Courtney Traub/All rights reserved. My visit to Ti Jos confirmed my impression that this was a Parisian restaurant with an unusually relaxed atmosphere. Its vibe is closer to a pub than a formal eatery– and this is accurately reflected in the owners characterising it as a “Pub Breton”. The inviting, relaxed interiors feature heavy dark wood tables and chairs, old armoires, and a little smattering of Breton paraphernalia, but not as much kitschy decor as you often see in creperies catering to tourists. You get the sense that this is the “real deal”, rather than a tired tourist trap. Sticking to our traditions, my partner and I ordered one savory buckwheat crepe and one dessert crepe each, plus a small jug of brut cider to pour into traditional, round little ceramic cups. 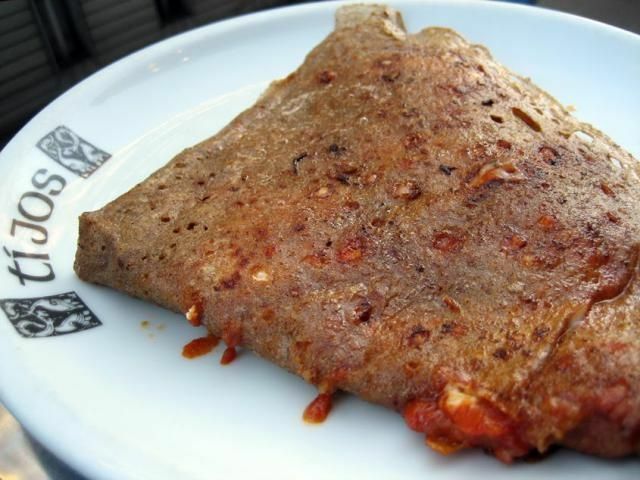 On the savory side, my tomato and goat’s cheese galette was presented in a generous heap on the plate–if many creperies daintily tuck the edges of the crepe over and present the filling face-up, at Ti Jos, the hearty filling is to be discovered only once cut into. The galette itself was deliciously buttery (I guessed it must have been made in the pan with salted Breton butter), and the goat’s cheese-tomato combination was quite tasty, if a tad too simple for my tastes– a bit of onion might have lent a bit more flavor. Still, it was very satisfying, especially accompanied by a crunchy side salad. My partner ordered a cheese and mushroom galette, reporting that it was simple but also very good. For dessert, I went for a crepe simply topped with a scoop of salted caramel ice cream, again made with Breton butter. It was delicious all around, although the ice cream quickly melted, leaving a pool of the addictive stuff floating on my plate. I appreciated it when the server asked if I wanted a spoon to get the rest of it, although I declined. 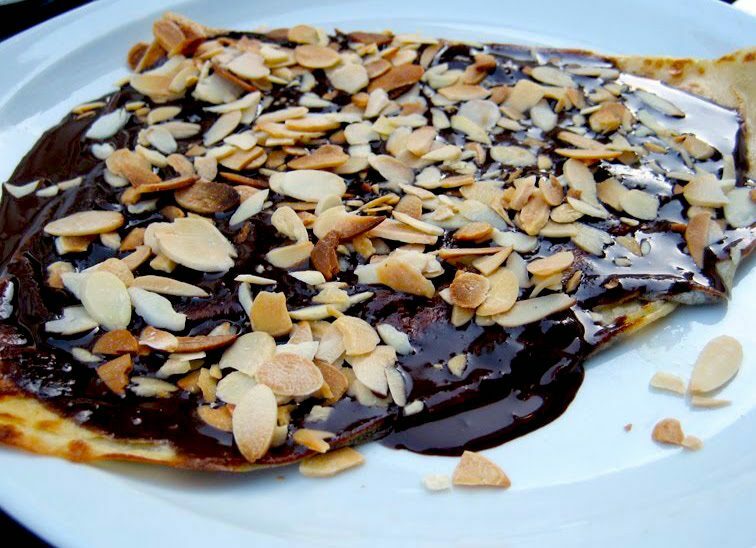 My partner’s chocolate and slivered almond crepe was doused in rich sauce, which was appreciated. Some, however, might prefer a little less of it. I’ve been told that the simple dessert crepes with Breton butter, sugar and/or lemon are also excellent at Ti Jos, and may prove better choices. Overall, this was a solid, simple, affordable, and tasty meal. Again, it may not be ideal for those who prefer more elaborate, creative ingredients or crepes that use a little less filling– but it’s a good choice if you’re big on generous portions and a focus on traditional recipes without the extra frills. 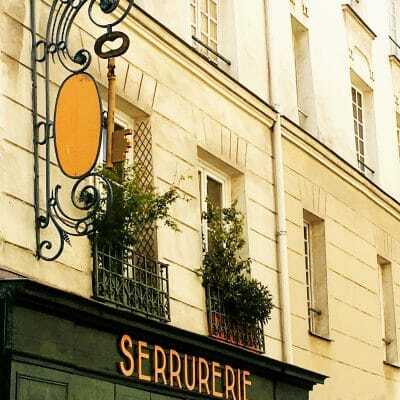 The restaurant is located in the bustling Montparnasse district south of the Seine river, on the Left Bank. The restaurant is open every day for lunch and dinner except for Sundays. Reservations are highly recommended on Friday and Saturday evening especially– call the number above or reserve here. Dress code: This casual pub has no dress code– come as you are, even in jeans and a sweatshirt. Kid-friendly? Travelers with kids should feel comfortable bringing younger companions along to dine at this family-friendly restaurant. It’s casual, spacious and relaxed. Another upside? The simple but tasty menu options should please many finicky young eaters, too: they can always opt for basic crepe fillings such as mushrooms and cheese or tomato and cheese. 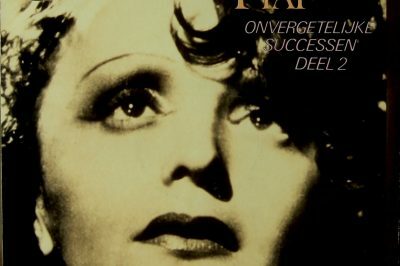 What to See & Do Nearby? 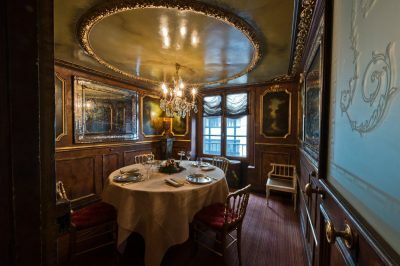 Before or after your meal, take advantage of the Montparnasse district to visit some of the area’s charming but frequently neglected sites. I especially recommend a whirl through Montparnasse Cemetery if the weather’s nice: It’s home to the graves of numerous famous denizens including Simone de Beauvoir, Jean-Paul Sartre and Charles Baudelaire. 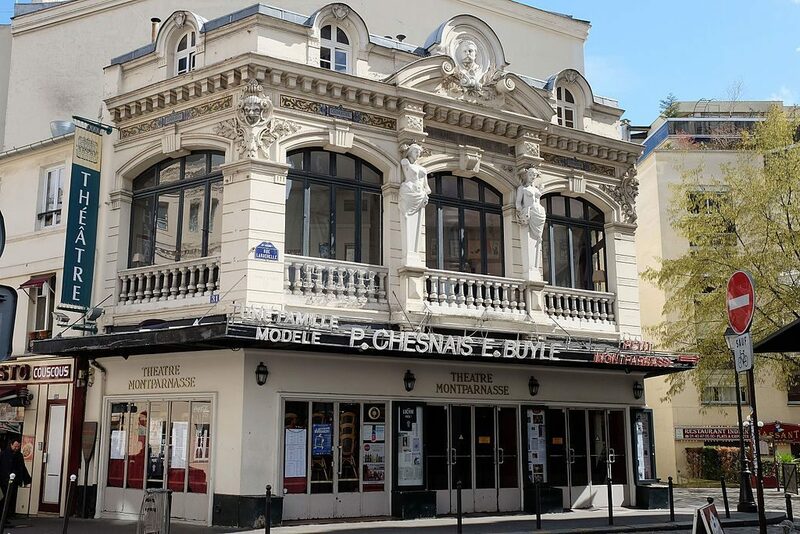 Also wander through down the nearby Rue de la Gaité, a charming theatre district in the area lined with sidewalk cafés and theatres populaires (venues traditionally catering to the Parisian working classes). If you have a bit of extra time, go check out an exhibit at the nearby Fondation Cartier for Contemporary Art, and go deep underground to see millions of human skulls and femurs artfully arranged within the claustrophobic corridors of the Paris Catacombs.